As with any Antarctic journey, our final trip started early and immediately the waiting game began. 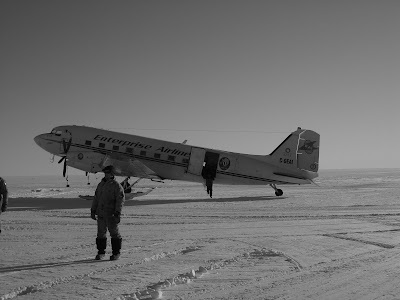 With the sun well and truly hidden, the temperature at 4:00am had dropped to -25C and the plane was iced up. It didn't look much, but as the pilot neatly put it - "it's enough to kill us". Frantic scrubbing with meths got the wings clean and an hour later we look off. The first hop took us to the South Africa station "Sanu" for fuel. Already 2 weeks into their winter, the whole base turned out the greet us and chat while the Basla guzzled Avtur . Taking off again, we flew for another 3 hours before landing smoothly on the Russian Blue Ice Runway at Novo. Novo is the centre of Antarctic air operations. Think Heathrow on ice, and you're not far wrong. 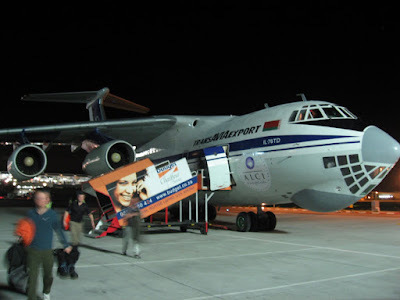 We had no time to look as we rushed straight onto a waiting Soviet era cargo plane. With no window, screeching engines and the feral stench of Antarctica (boots, thermals and canvas, all heated to 25C) the 6 hour journey made easyjet seem like heaven. But we made it. Back on tarmac, back to reality. 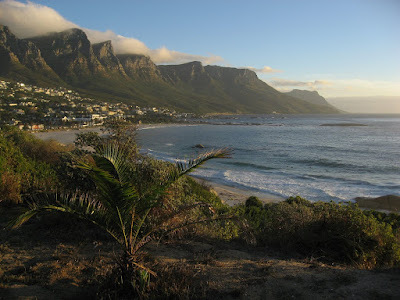 Cape Town's a far better place for rehab than the Falklands. In one day I walked up Table Mountain, ate perfect steak and danced the night away to cheesey live bands. It's kindalike Dar Es Salam meets Cardiff St Mary's street. And I'm off to enjoy it all. It's been fun reading and looking at the great pics. Have fun in Cape Town! Thanks for the wonderful read and photos over the last 18 months. Enjoy your time off before you get back to the "real world". Nice one Dave, cheers for the read! Reply to your email you big git. iInter started yesterday Dave, base is back to quiet mode. Tis great. Need to sort out a band now! Skype me when you can! Absolutely gutted that the last few posts occurred whilst I was away so I wasn't able to keep up to date! But a huge thankyou for photos and writing. Truly fascinating. Thanks for the comments and I hope you liked the blog. South Africa is great fun (despite there being no waves at J-Bay!). I'll stick a final "Post Script" entry on when I edge back into the real world, but for the time being hope all's good! I can only say what everyone else has said Dave - great reading. Did you fly in the DC-3?